Ayrton Senna Da Silva was born in Sao Paulo on 21 March 1960. He began driving karts at the age of four and became the Pan-American kart champion in 1977, Before moving to England in 1981 to race Formula Fords. 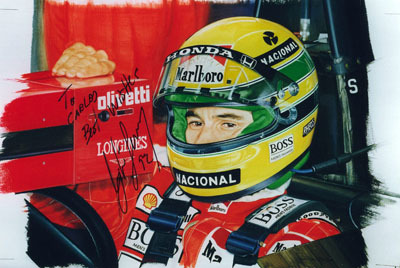 Senna won the British FF1600, the British and European FF2000 championships, and then won the British Formula 3 series. He joined the Toleman F1 team in 1984 and almost notched up his first win at Monaco in the rain-affected race which was stopped before half-distance. When he joined Toleman he told them that "...I will do everything for you. Every time I get in your car I'll give 100% efforts. But if I eventually decide that the car is not competitive, I will go to another team..." Which is precisely what he did. In 1985 he joined Lotus and won five races. Peter Warr - his boss at Lotus - described Senna as arguably the greatest racing driver of all time adding: "...His refusal to accept anything less then perfection in his quest to seek out the limits of his awesome ability motivated and captivated everyone in the team..." When he joined McLaren in 1988 he found a car and a team which could deliver the world championship to him. He was champion three times for McLaren, winning 35 races and starting on pole position a remarkable 46 times. It was during these years that his rivalry with Alain Prost intensified to almost dangerous levels as they battled it out on the track. 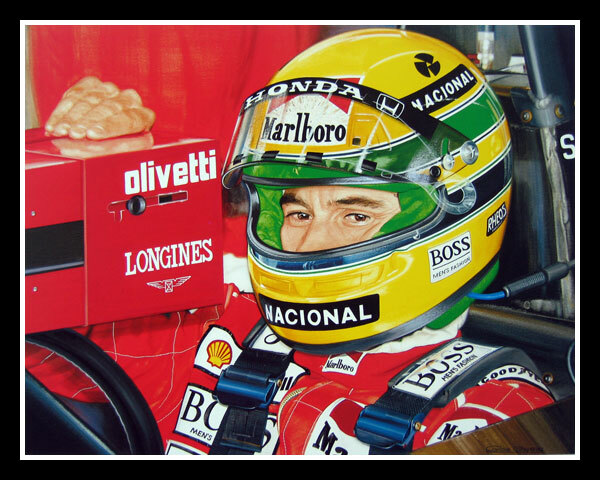 Senna's refusal to be second best on the track and his ruthless devotion to the job hid his private side. Here was a man who was fiercely loyal to his family and country. He had a very strong faith and gave an enormous amount of time and money to charitable concern and was usually the first to visit injured drivers and to continue the check on their health. Senna joined Williams in 1994 but during the San Marino Grand Prix, on 1 Mai, he died when his car went of whilst leading at the Tamburello curve. The shock around the world was immense, and the Brazilian President declared three days of mourning to honour their national hero.